Can I buy a Deutsche Bahn online ticket starting from one station, but enter the train on the next one? Is it possible to buy DB online ticket from one station, and enter the train on the next one? Specifically, to buy a ticket for EN 446 sleeping car starting from Frankfurt(Oder) to Köln but enter the train on the next stop after Frankfurt - i.e. in Potsdam. The reason is that DB site doesn't allow one to buy a ticket for the Potsdam - Köln route into EN cars, but instead offers to buy more expensive tickets into CNL 40458 cars (which goes as the part of the same train starting from Potsdam). Me: Why can't I book EC446 from Cologne to Frankfurt/Oder online although it stops there? DB: Do you mean EN 446? In Potsdam we don't plan for people to get on, only off. That's why this station cannot be booked. Me: Yes, that one. Can I book from Frankfurt and get on in Potsdam anyway? Me: Are there bouncers? Can I get on later in regular ICE trains? For example if I have a ticket from Berlin to Cologne, can I get on in Spandau or Wolfsburg? DB: Our people are on the platform. Of course you can get on later, but remember that seat reservations are forfeit after 15 minutes. So we can conclude that on this particular train, you cannot do that. We don't know why exactly, but if you try anyway and they catch you, they might not let you in. You can always leave early or get on late in regular trains. Your tickets with Deutsche Bahn give you the right to be on the train (or any train on a direct route) between two stations. They frequently do not check tickets between two or more given stations. There is no way for the conductor to tell if you sat there for one station, two stations or longer if they are passing through the carriage for the first time to check tickets after the fourth station. It can also happen that you get never checked because you got on at the other end of the train and get off at the next station while they are still busy somewhere else. The above Twitter conversation confirms this personal experience. Bonus-Information: If that happens and your printed ticket does not get checked/clipped your City-Ticket in the destination might not be valid. You need to go get it stamped at the information desk in the destination station or local public transport might fine you for not having a ticket. For any and all night trains running through Germany (EN and CNL — as long as the latter still exist) there is a clear distinction between stations for boarding (departure time only is given in official timetables) and stations for exiting (arrival time only is given). You cannot board the train at an arrival station and you cannot exit the train (or: should not, but noone can stop you …) on a departure station. Thus, your trip is not possible. You can get on the train at a later station, assuming that that is still a departure station. For example, in the Hamburg–Munich night train, you can board in Hannover rather than in Hamburg (both are departure stations). There should typically be no reason to do that, though, since tickets should be more expensive from Hamburg in any case. For day trains, as long as you are on the correct train when you have Zugbindung, all is fine. Not the answer you're looking for? 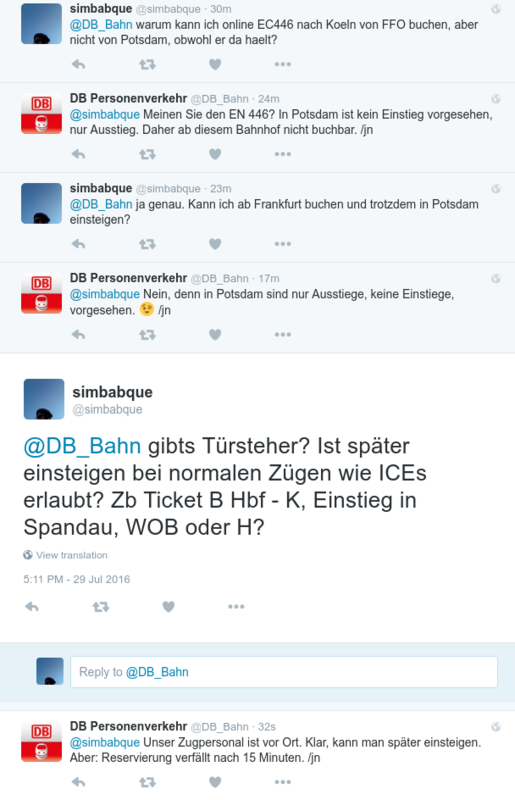 Browse other questions tagged trains public-transport tickets germany or ask your own question. How to use Kurzstrecke ticket to travel from Berlin to Potsdam? Absolute cheapest transport from Malaysia to Singapore with e-ticket that can be bought online from overseas? Why was my Deutsche Bahn train “cancelled” and replaced by the same train, but a different number? In Germany, can you take a non-stop train if you have tickets for individual stations on a train that stops? Is stopover allowed with an offpeak train ticket in UK?